TIGERLIM.COM: How To Cook "Golden Fried Rice"
I think I'm a person who are love to cook fried, maybe that is because I love to eat my Mom's fried rice when I was a young boy! 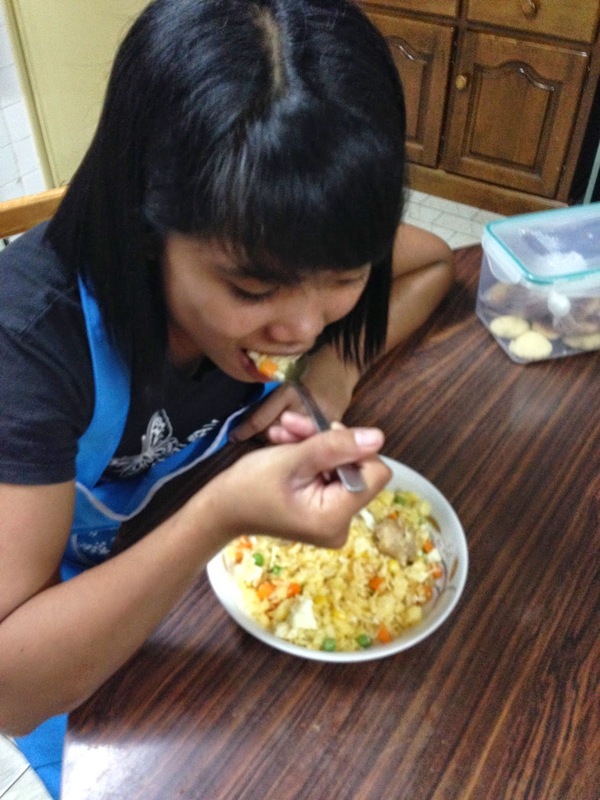 When every time she cook fried rice I always love to help her to stir stir stir.... hehehe say I help I think is more like kacau her coz the rice always over stir out of the wok!! So now when I got nothing to do at home or lunch time no left sayur for me I always cook fried rice for myself! There is 2 way I cook fried rice.... is Got Mood and No Mood!! No mood is fast and yummy, Got mood is not so fast but more yummy! Normally if I Got Mood one is I cook for other people to eat.... me myself I always cook No Mood. So what the different my Got Mood and No Mood fried rice? In fact both also using the same ingredients but it just that my Got Mood fried rice the egg york and egg white is separately fried! So today I Got Mood I cook my famous Golden Fried Rice for my maid because pity her tonight the sayur not much left for her!! Now everyone come I teach you how to cook my Golden Fried Rice here... Is very easy one.. if you know how to fried an egg then you can cook this too! 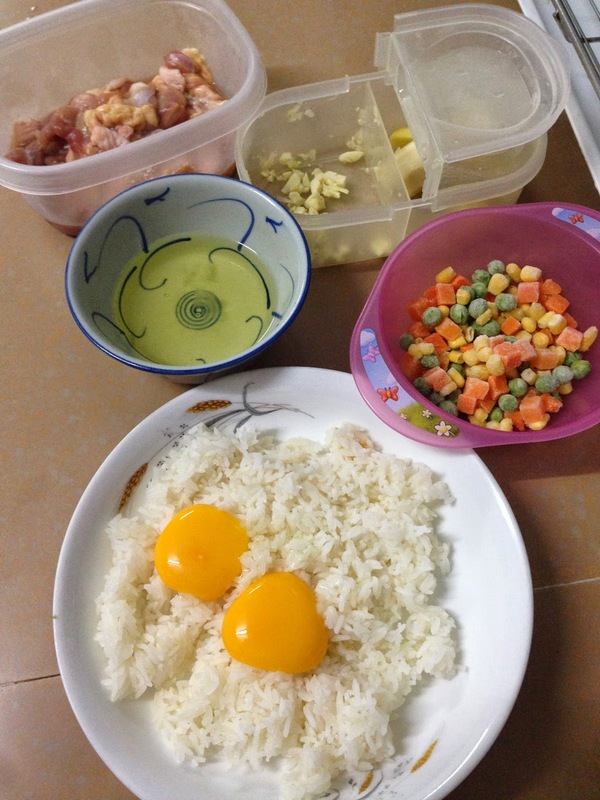 My Golden Fried Rice ingredients very simple! So first and most important thing is mix the egg york with the white rice before to start your fire!!! If not later you don't have time to do it and make it perfect! Normally everyone fried the whole egg with rice but if you do in this way not only the rice look like golden color but also the egg smell nicer and yummier too!! Mix mix mix until it even and make sure all the rice got touch egg york!!! Ok now start the fire.... wait hot then oil the pan. then fried the chopped garlic... wait a bit yellow then put the chicken!!! Don't wait until the garlic fully brown then you fried the chicken coz like that the garlic will turn bitter at the end when you done the fried rice!!! Chicken not need to fried long long there.... we don't want over cook the chicken! So when you fried the chicken all white no more pink color then you can down the egg white!!! fried fried fried... fried all together until the egg cook! Then when the egg is cooked the chicken also cooked too. This is the moment you down the Egg York Rice!!! Fried it and mix it all!! Now this is the moment you start smell the fried rice yummy yummy!!! Then Mix Vege come in!!!! Mix Vege are already cooked so not need fried so long! once you mix them all together then can start put chicken power!! Me don't like too salty... so I drop one small tea spoon of chicken powder enough already! Then fried fried fried and see the rice dance then Ok ready to serve!!! Simple and easy right. If you don't separate the york the fried rice is white color and normally people put soya sauce to give it color look nicer! My one not need to add color also look golden here! chicken no over cook, mix vege just perfect!!! This is a reward for my maid!! !